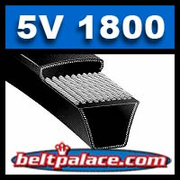 5V1800 Bando PowerAce® Narrow V BELT (5V1800 GATES SUPER HC®). Replaces Goodyear 5V1800, Dayton 13V757 (Grainger). "Narrow" cross-sections can transmit up to three times the horsepower of the classical cross-sections (A, B, C, and D) in the same amount of drive space. 180" Length (4572mm), 0.62" Wide (16mm). Meets or exceeds RMA standards for static conductivity. For use on special drives where space and weight limitations are critical. 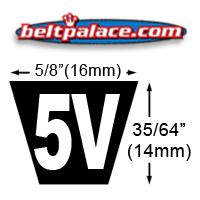 Transmits up to three times the horsepower of conventional V-belts.